For generations, Pacey’s Pianos has been dedicated to the ideal and tradition of delivering the finest pianos in the world to Vancouver, British Columbia. As a family business, the Pacey’s have indeed adapted with the times of an ever-changing industry, but remain steadfast in their commitment to unsurpassed customer service and quality control. Being Western Canada’s premier distributor of quality musical instruments, Pacey’s Pianos have made it part of their mandate to offer a wide-range of indulgent and luxury pianos at affordable prices. Pacey’s Pianos cordially invites all pianists – aspiring, established or otherwise – to come down to their extensive and welcoming showroom to see what they have to offer. Coming highly recommended by Vancouver’s top piano teachers and technicians, Pacey’s Pianos encourages you to stop by and see what all the fuss is about. If you are looking to buy or rent either a traditional, upright, grand or digital piano, we need not look any further: Pacey’s Pianos have the piano that’s right for you. 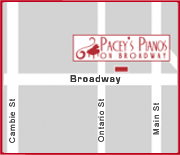 Pacey’s Pianos provides services to Metro Vancouver, Vancouver Island, the Interior, Northern British Columbia, and everywhere in between. Ranging from entry to exquisite, Pacey’s Pianos stocks beautiful, brand new instruments from all over the world, including – but not limited to – Italian, German, Japanese and, certainly, American pianos. We’ve got what exactly what you’re looking for. All of the used instruments at Pacey’s Pianos vary from good to impeccable condition and carry a 10 Year Warranty. As the largest dealer in British Columbia of used Yahama and Kawai pianos, there is no doubt we have the piano for you. As Vancouver’s best-loved rental house, Pacey’s Pianos specializes in short and long term rentals and provides a spectacular Rent to Own program. Only at Pacey’s Pianos can you take home a gorgeous piano for an unbeatable low monthly fee with no damage deposit, where each an every payment you make goes towards the final purchase. As a full-service institution, Pacey’s Pianos are capable of handling any and all of your piano needs. We offer tuning, repairs, moving, and restoration. We believe that it is our duty to assure you a magnificent instrument that will last forever. As part of our service to all Pacey’s Pianos customers, we follow up with customer service well after your piano has made a place in your home. Mason & Hamlin 50 Upright Full size with deep bass, rich harmonies, and breathtakingly lush tones. Ranked in the top tier with Steinway & Sons, Bechstein, and Fazioli, yet priced substantially lower. This Mason & Hamlin 50 will bring you 150 years of American tradition to your home for the price of a new Yamaha U3. We are currently holding a massive Italian piano sale featuring Bluthner pianos. These instruments are hand-built in Germany and are heirloom-quality pianos. These instruments retail at $48, 000 but they’re currently on sale through Pacey’s Pianos for $30, 000. This is a huge container sale and we guarantee the lowest price. Hurry, sale ends soon! Pacey's is proud to support local independent piano teachers in Metro Vancouver. The Piano Teachers Federation is a non-profit organization dedicated to supporting local teachers in your community.